This phablet does more right than it does wrong. Solid performance and manageable battery life with a great fingerprint scanner as the headline feature. Unfortunately, some UI issues do remain as does the presence of bloatware. Phablet devices are big business right now. 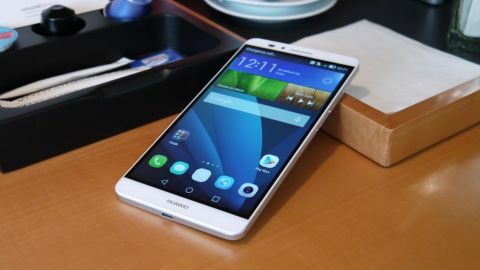 It's courtesy of devices like the Apple iPhone 6 Plus, Samsung Galaxy Note 4 and this; the Huawei Ascend Mate 7. It's the Chinese company's latest flagship device, but proffered as a large-screen alternative to (rather than a replacement for) the Huawei Ascend P7. Coming in as a successor to last year's Ascend Mate 2, the Ascend Mate 7 is actually smaller in terms of screen size. It measures 6 inches with a full HD 1920 x 1080 resolution, compared to the Mate 2's 6.1-inch display. And you haven't missed Ascend Mates 3 through 6. Huawei has jumped straight to Mate 7 to bring the new device in line with the G7 and P7. Huawei has upped its quality considerably over the last few years when it comes to flagship devices and the Ascend Mate 7 has been given the same thoughtful treatment. It boasts an aluminium unibody that immediately brings to mind the HTC One M8 while a rear-mounted fingerprint scanner and new-look UI round out the headline features. Additionally, you can use the microSD port as a secondary SIM slot for dual-SIM functionality, but more on that later. Pricing isn't perhaps what you'd expect. The Chinese company is offering the 16GB base model with 2GB of RAM for €499 (around £400, US$650, AU$690) with the 32GB version coming in at €599 (around £480, US$780, AU$830). The latter ups the RAM to 3GB, but also forces you to accept the handset in gold. The Ascend Mate 7 not only has a slightly smaller screen than its predecessor, but also a thinner body and minimal screen bezels. Any 6-inch phone is still massive in your hands, but Huawei has done a good job of cutting away excess flab. The handset itself is 157 x 81 x 7.9mm while the screen-to-body ratio is 83% - which is ahead of Samsung's 80% ratio on the Galaxy Note 4. Turn the Ascend Mate 7 over and you're greeted with the device's 13MP lens - protruding slightly from the chassis - and the fingerprint scanner. Mostly thanks to Apple's Touch ID, the scanner has become the de rigueur addition to modern smartphones. On the Mate 7, the scanner can be used to awaken the phone instantly without having to hit the power switch first - a feature that really makes sense and works well in practice. Like other phone companies, Huawei keeps the data from the fingerprint scanner encrypted and on the device. It can be also be used to open certain apps, although the information is never passed to third parties. The back of the Ascend Mate 7 is slightly curved, although this is really only noticeable at the edges of the handset as you try to extend your fingers around its impressive frame. Huawei has done a good job on the weight, keeping it down to a respectable 185g despite the size. The metal unibody is sleek and cool to touch, which gives it a nicely premium feeling. The feeling doesn't quite continue to the Ascend Mate 7's software, which is handled by the company's Emotion UI skinned over Android 4.4 KitKat. It's the third version of Huawei's home-grown UI and features a couple of slight tweaks that will take some getting used to. There's no app drawer listing all your apps. Instead, they're on the homepages. Huawei has also added the Android Lollipop-style navigation buttons to the bottom of the screen, even though the handset is still running KitKat. The Mate 7 is powered by an octa-core Kirin 925 processor made up of a quad-core 1.8GHz Cortex A15 chip and a quad-core 1.3GHz Cortex A7. As mentioned before, RAM comes in either the 2GB or 3GB flavours depending on whether you opt for the 16GB or 32GB model. Huawei has tucked a non-removable 4100mAh battery into the Mate 7 which, as you'd expect, is a pretty serious power source. Unfortunately, the 6-inch full HD screen is a hungry beast and you'll not want to venture too far from a power source. But more on that later. Like them or not, phablets are a legitimate phone category now and Huawei's given us a good one with the Mate 7. It's not perfect though, and faces strong competition from the iPhone 6 Plus, Samsung Galaxy Note 4 and Nokia Lumia 1520. Size prohibits this phone from being one you operate one-handed, but Huawei has done what it can to help. That includes placing the power switch and volume selectors on the right hand-side of the phone so you can get to them with either your index finger or thumb, depending on which hand you're using. There's also an option to activate the one-hand UI feature that lets you tilt the Ascend Mate 7 to reposition the soft-touch Android navigation keys to one side. And Glove mode adjusts touchscreen sensitivity so you can use the phone while wearing gloves. But let's talk sizing specifics for just a second, because the Huawei Ascend Mate 7 is a biggie. The length of the handset is 157mm. In comparison, the Samsung Galaxy Note 4 is 153.5mm. The iPhone 6 Plus just pips it at 158mm in length, but Apple's screen size is only 5.5 inches while Huawei has managed to cram in a 6-inch display. The reason for that is the Chinese company has worked to remove almost any trace of bezel around the 6-inch 1080p screen. There's still a small black edge to the display itself but if you're using a black UI theme it's quickly forgotten. Perhaps to offset the size somewhat, Huawei has opted for curved corners rather than an industrial, blocky design. The back of the phone is also curved to allow it to rest comfortably in your palm. There's minimal space above and below the screen - just enough room for the Huawei logo below and the front-facing 5MP camera and speaker above. This has both benefits and drawbacks. As Huawei no doubt intended, it means the screen takes up the maximum amount of space and is the real centrepiece of the device. The drawback comes in the form of sound. Rather than the front-facing dual speakers employed by the HTC One Max, the Ascend Mate 7 pushes the grill behind, meaning you're liable to cover it with your fingers when holding the device in landscape mode. It means that, while video looks great, the sound suffers. The top and bottom of the device are given over to the 3.5mm headphone jack and the microUSB charging port respectively. On the left hand side is where you'll find the nano SIM and microSD slots, both requiring a SIM ejector tool to spring open. Unlike Samsung's Note series of phablets, Huawei hasn't included any kind of stylus, so you're going to be using your fingers with this one. It's hard not to be appreciative of Huawei's approach. The company's worked out from its competitors what good design is - just look at the similarities between the Ascend G6 and the iPhone 4S. I want premium metal finishing and a robust heft, without feeling like a phone will fall apart at the slightest knock, and that's what you get with the Ascend Mate 7. Of course, no amount of elegant design choices can stop the Ascend Mate 7 from dominating any hand or pocket, but that's a size issue - and one that doesn't detract from the overall appearance.